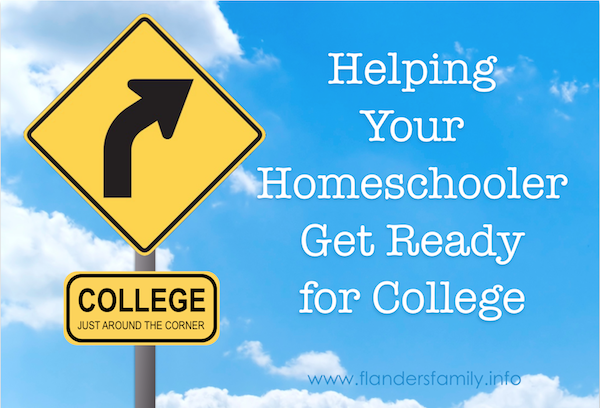 Do you have any tips about getting your child ready for college? I know you are knowledgable about the subject. It is overwhelming! Anything would be appreciated! I begin by printing a blank copy of my high school transcript shortly before my student starts ninth grade and use it to pencil in the subjects I plan to teach and when (what year/semester) I plan to teach them. Invariably, things get shuffled a bit before graduation, but this gives me a starting point. So far, our graduates have all ended up majoring in science or engineering, and we’ve found that Saxon Math and Apologia Science have more than adequately prepared them for college level course work. For specific curriculum recommendations in other subjects, refer to this page. Some of our children are fonder of reading than others, but the years we’ve spent using Sonlight (a literature based curriculum) really paid off, even though I’ve ended up reading a lot of the assigned books aloud. Really, the more reading you can get your kids to do — not necessarily even assigned reading, but pleasure reading on topics of personal interest — the better prepared they’ll be when it comes time to start college classes (and the higher they’ll score on standardized tests). Don’t let the upper level courses scare you. There are so many options available these days for teaching topics that are beyond Mom’s area of expertise. There are co-op classes, video courses, online classes, dual credit classes, private tutors, etc. One program we’ve recently started using with our high schoolers is Landry Academy Lab Intensives. They pack an entire year’s worth of science experiments into a 2-day class, and my children have absolutely loved it! Early bird discounts allow you to register for a fraction of the cost, making these intensives even more affordable. College admission boards typically place more stock in SAT scores than in transcripts and grade reports, but this is especially true when they are evaluating home schoolers. It is imperative, therefore, that your student do her best on these exams. At a minimum, you will want to have your child take a few practice exams before sitting for the real thing. We did this with our older students and saw marked improvements in their scores (to the tune of 250-300 points) after just two or three practice runs. You might also consider a prep course — especially if your child hasn’t had much experience taking timed tests. The one we’ve used with our last couple of graduates (and plan to keep using with the remaining children) is College Prep Genius. It is available in a textbook/workbook or in a DVD format. The course teaches lots of simple “tricks” to taking standardized tests that will improve the score of any student familiar with them. If you have some idea about where your student wants to attend college or what field she wants to study, you can tailor high school coursework to dovetail or even overlap with college classes, and count the work on both transcripts, either by signing up for dual credit classes at your local junior college or by taking CLEP exams over material learned at home. Even if decisions about where to go and what to study have not been made, you know there are some core classes common to most every college degree and can chip away at those. To maximize your use of CLEP tests, check to see which tests are accepted by the school(s) your child is considering, as well as a list of minimum scores required on each test. (Most schools have such a list you can download and print, which is exactly what I’d recommend you do. Once you are on the university’s website, just search for CLEP or Credit by Examination. If more than one school is in the running, cross-reference these lists and start with the exams that are accepted by both schools. If this sounds too complicated, you might look into having College Plus design a degree plan for you. Depending on your child’s major, he may be able to cut his time on campus in half (two of our sons did this) or even CLEP out of his entire degree (a friend of ours used College Plus to “test out” of his entire Bachelor’s degree, then went on to attend law school on a full scholarship). Speaking of scholarships, it’s never too early to start applying. You can earn scholarship for writing essays, doing community service, performing well on your SAT, being tall, being short, being left-handed, having red hair. You’d be amazed at all the money available for kids who want to go to college! You’ll want to provide your student opportunities to invest in her community, and track the hours she serves. Our children have earned community service hours by teaching Red Cross swimming lessons, working in food pantries, serving as Azalea Belles, candy striping at the hospital, volunteering at the library, going on mission trips, teaching Bible study classes, etc. etc. Don’t forget to make note of these activities on your child’s transcript, as well. And last, but certainly not least, before sending your child away to college, make sure he knows how to prepare a few simple meals, do a load of laundry, fill up a gas tank, change a flat tire, clean (and plunge) a toilet, balance a checkbook, fill out a tax return, stick to a budget, make a bed, pay his bills, etc. If you start early enough training him in some of these areas, you may work yourself out of a job even earlier than expected. Shouldn’t that be our end-goal, anyway? Those are the tips that immediately spring to mind. Have I forgotten any? What would you add to this list? « It’s All About God’s Grace! Thank you! A friend and I were just talking about this topic, so it was perfectly timed. You’re so welcome, Hayley. Glad to be of service!